Marketing is a crucial component for all businesses, and companies are continually on the lookout for new ways to effectively reach their target audience. However, consumers and businesses alike are increasingly leaning into digital, changing not only how workplaces operate – but how departments cooperate. Tools that are critical to marketing success now rely on digital technologies – requiring IT support, and a collaboration between IT and marketing teams to develop, deliver, and maintain marketing tools that are effective for the current digital landscape – and its ongoing evolution. 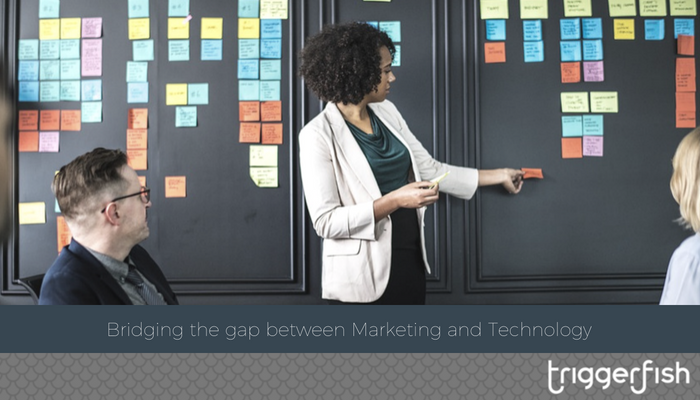 One of the most significant issues when it comes to bridging the gap between marketing and technology is that marketing and IT teams often aren’t on the same page. Marketing executives concern themselves with client growth and adopting new technologies, while IT executives focus on compliance, security, and the infrastructure that exists within a company. Often, if a marketing team pursues a new vision, IT will be required to create the end product. However, the marketing team may not fully comprehend whether what they are trying to achieve is possible, nor may they have the technical knowledge to understand the process required to create the end product. This can create a disenfranchised feeling between teams, with one not understanding the other – generating ongoing frustration. For both parties to work together effectively, they need to align their goals and strategies and work together and realise that corporate success in a modern marketplace is reliant upon their ability to collaborate and communicate with each other. To help marketing and technology parties work together effectively, they must have a mutual roadmap and vision for projects. If marketing requires a strategy to pursue client deliverables, then IT needs to be able to prioritise those deliverables in line with existing – and potential – infrastructure. For example, if a new app is required to facilitate user engagement, both teams need to understand what the new feature needs to achieve, what the timeline is, whether or not these things are possible, and how they line up with the company’s objectives. This helps ensure that departments are prioritising work in an efficient – and open – manner. Collaboration also assists with digital evolution in the consumer space. Modern users are consuming – and producing – more data than ever before. This data provides marketing teams with valuable insights; but only if they know how to analyse and interpret it. IT teams can assist with this process, utilising their expertise to help drive marketing initiatives. Senior leadership teams should be helping facilitate this communication, ensuring that IT and marketing are in touch with each other on a regular basis, and even more so regarding critical projects and deliverables. This includes long-term strategy and planning, and the coordination of multiple projects across departments. How is the digital marketplace driving our expectations within the company? Are the digital advancements we want feasible within existing architecture? For IT teams, these questions mean understanding what the marketing team is trying to achieve. From another angle, marketing needs to consider that the IT perspective is different to their own and that digital solutions need to align with existing corporate infrastructure. To bridge the gap between marketing and technology in your business, you need first to understand what challenges your departments need to overcome to pursue mutual success. At Triggerfish, we believed that aligned marketing operations programs are the foundation for profitability and growth. We can help you build and deliver an effective strategy based on market-insights and technology that meets the needs and capabilities for your business. Contact us to find out more, and schedule a free 90-minute meeting with our experienced consultants today.